At G & H we pride ourselves in giving the best service we possibly can. In the shop we have an extensive library of wallpaper and fabric books for you to browse through at your leisure. Our experienced staff are always on hand to help you navigate through the wide selection available and to help you make the perfect selection. 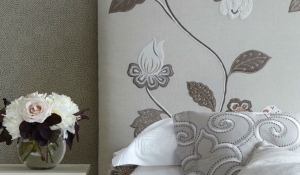 When buying wallpaper from us, we can advise you on measuring and help you work out the correct quantity of paper to order. The same applies to bespoke made curtains and blinds. We will advise, measure, make and install perfectly so you can have complete confidence in the beautiful finished results. If you think you would like a little more help, our interior design service is very reasonably priced for advice on everything from a detailed colour scheme to furniture placement and layout. Often people have one or two items they cannot change but find it hard to know how to incorporate them into their new scheme; we can help.